The incentive of thousands of dollars compelled me to buy hotel-quality sheets, consider feng shui, and clean the shower. Then things got weird. For a heady year, cash and friendly faces flowed into my apartment, paying my rent while I scraped together money to build a startup I had dreamed about for months. My apartment photographed well and tourists love Brooklyn; before long the two spare rooms in my place were grossing a thousand bucks over the cost of my rent on Airbnb.com, the vacation-rental site that ranked 19 on FastCompany’s list Most Innovative Companies list this year. The future seemed so sweet and easy that another host in my building rented a second apartment around the block just to host Bnb’rs. We wondered if our landlords had any inkling of the margins. The incentive of thousands of dollars compelled me to buy hotel-quality sheets, consider feng shui, and clean the shower. A girl from Australia arrived with a gift of Vegemite. A guy from Portland flew in to get some additions made to his full-body tattoo. A woman from San Francisco left a long thank-you note in very peculiar handwriting. I went to a New York Red Bulls game with a British guest, got a proper heckling lesson, and debated the appeal of Kate Middleton. In nine months, my Airbnb profile grossed me almost $20,000. When my reservation requests started to trail off, I got onto Airbnb to find dozens more hosts had popped up nearby, undercutting my nightly rate. Then I spotted something else: an Airbnb listing in a building nearby, hosted by a guy I recognized as my landlord’s right-hand man. My landlord had caught on. When I delivered my rent at the beginning of the next month, I found the management company’s office under construction. It’s now a hotel. The “loft-style” rooms are now listed on Airbnb for $169 a night. On Monday, June 4, about 10 days before my cofounders and I planned to push our first product into the iTunes App Store, a stranger in a blue blazer served me with a restraining order filed by my landlord. There was language requiring me to kick out my guests (a German couple) immediately after being served, but the judge had crossed out that section and initialed in the margin; I guess he found that part punitive. My lawyer later told me I would probably be forbidden to have roommates again, which in the pricey New York rental market is tantamount to eviction. Attached to the order was a complete printout of my Airbnb listing and all my reviews, included as evidence I had violated clauses in my lease. (Some leases, I have since learned, have evolved specific language prohibiting tenants from listing their pads on vacation-rental sites such as Airbnb.) I had flouted the same clauses back when I found roommates through Craigslist, but there I was just another anonymous roommate-to-be with grainy, sideways pictures of my kitchen. 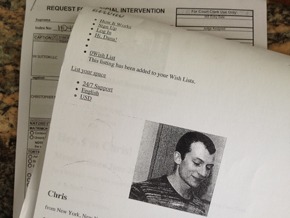 The Airbnb printout looked idiotically flagrant by comparison; one page of the restraining order showed a big, pixellated image of my Facebook photo next to my Airbnb profile. I seethed at the social Web for making it so easy for the world’s narcs to track me down. Then, I tweeted @airbnb about my predicament and immediately received an email that restored my faith: They graciously offered to re-book my remaining guests until I got my legal situation sorted out. I quickly wrote back: Yes, please. Not a problem. Our team will take care of them. I’m due in Kings County Court on June 7th, Thursday morning. Read the conclusion of this story here: My Airbnb Biz Got Me Evicted; Here’s What I Learned.